5 Bedroom Detached House For Sale in Woodbridge for Offers Over £600,000. 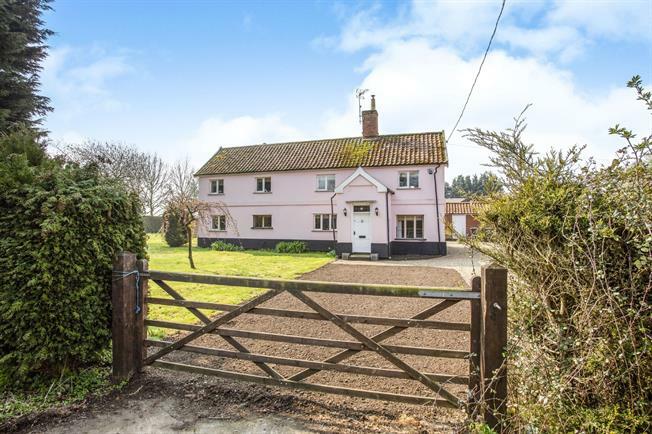 NATIONAL OPEN HOUSE EVENT - SATURDAY 27th APRIL - CALL NOW TO BOOK YOUR VIEWING The perfect slice of country living Situated just beyond the five bar gate, this 18th century farm house has been lovingly refurbished and offers a family home like no other. Set back off a quiet country lane and sheltered by hedgerow, Corner Farm is nestled amongst the rich farm lands of Suffolk. From the welcoming entrance hall you will instantly feel the generous space this home has to offer, the study sits immediately to you right an is ideally located over looking the drive and then onwards to the dining room which is a real wow with it's inglenook fireplace and wood burner and leads beautifully through to the spacious kitchen where you have room for the breakfast table too, plus a utility room. The sitting room sits to the rear and boasts double doors out to the gardens and stunning engineered oak floors that run throughout. Upstairs you will find five double bedrooms with the master suite boasting an en-suite your friends will be envious of! Two further bedrooms share a 'Jack & Jill' style en-suite in addition to the family bathroom. Outside you have a manicured lawn and a driveway with parking for several vehicles in addition to the garage. Viewing is highly recommended.